Hey ya'll! 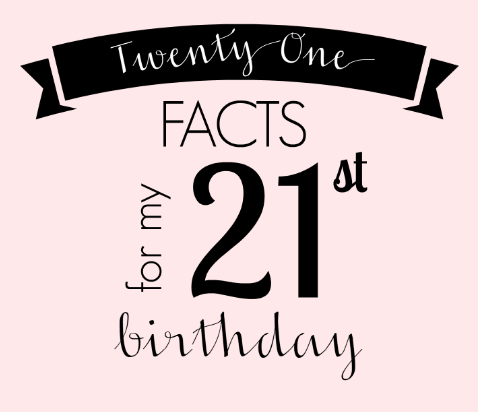 My 21st birthday is coming up this weekend so I thought I'd take some inspiration from my fellow blogger and friend Katie over at Cup of Tea and share 21 Random Facts About Me! I've noticed quite a few new faces here so it's also the perfect time to do a sort of "get to know me" post :) Enjoy! 21.) I'm the second oldest of 6 kids (Sean, my older brother is 24, Hannah is 15, Carson 9, Amelia 5, Lila 3). I think being an older sibling to so many babies made me skip over most of those "first time parent" fears, haha. 20.) My favorite food is pizza, particularly Imo's pizza here in St. Louis! 19.) I've rewatched the entire series of Mad Men more times than I can count. I'm 99% sure I have all the lines memorized. 18.) I've also reread the entire Harry Potter series at least a million times. 17.) I actually learned to read when I was 2 years old. I got special access to the "big kid books" in kindergarten, meaning I was allowed to read chapter books (like Harry Potter) instead of picture books. I was very proud of it. 16.) I love to bake and create. My Pinterest is riddled with potential DIY's and recipes. 15.) From a very young age I have been obsessed with vintage. Everything from TV shows (Bewitched and I Love Lucy are my favorites) to music (Glenn Miller and Frank Sinatra...swoon), to clothing and furniture. I have a special love for vintage advertising, and I've never been quite sure why. I just love to see old magazine ads, product packaging and commercials. No wonder Mad Men is my favorite show! 14.) I am 1/8th Native American. I'm not sure what tribe I belong to, but I'd love to find out! 13.) One of my favorite things is getting Lucy out of bed after naps or in the morning. She always wakes up so happy and playful! 12.) My hubby showed me so much about God's grace and has taught me even more about His Word. I believe he is the reason I was saved at all, and I thank God every single day for putting Preston in my life. 11.) My dream job is to be a copy editor, particularly for a magazine or newspaper. I love to proofread and am a little bit of a control freak, so I think it would be the perfect career for me! 10.) I played softball for 13 years. I also dabbled in basketball, gymnastics, dance, and poms but nothing else ever stuck. I loved dance but wasn't very good at it. 9.) I've been involved in theatre and choir since a very young age. Nothing beats the feeling you get when you walk out on that stage and perform what you've been working so hard on for so long, especially when you do it flawlessly. 8.) I can only eat Oreos if they've been dunked in milk and turned slightly soggy. 7.) My current home is in St. Louis, Missouri, but I would love to live in Lexington, Kentucky with my family. It's my home away from home and always will be. 6.) I have ridiculously sensitive skin. Sometimes my hands will itch and burn just from something in the air and I've never been able to wear earrings for longer than maybe 12 hours. 5.) I am an obsessive planner. Sometimes I even plan my day by the hour. Like I said, control freak. 4.) I am one of the pickiest eaters in the world. It's usually a texture thing. I never eat any kind of condiments on my food (no ketchup, mustard, mayo, BBQ sauce, etc) and I tried a banana for the first time about a year ago. I hated it. 3.) I watch Disney movies all the time and the Disney station on Pandora is on high repeat in my house. I love it all. 2.) I love to decorate, especially around a theme. I wish I could throw parties for every holiday and then some, and I've always wanted to attend a fancy Christmas or New Year's Party where everyone dresses formal and drinks champagne. 1.) Christmas is my number one favorite holiday. I prep for it all year long, listen to the music and think of gift ideas constantly.